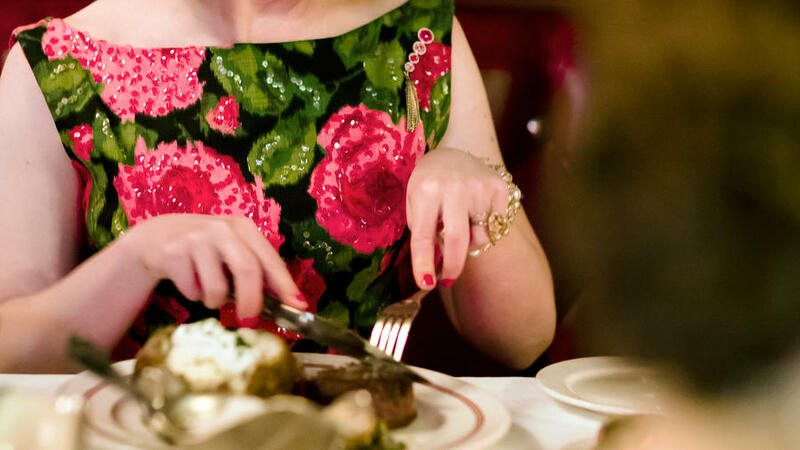 Eating at Alfred’s Steakhouse in San Francisco inspired us to tackle that magnificent multi-course experience at home. First, we sent out invites with the menu (to make sure our friends knew to come hungry!) and enlisted one friend ahead of time to help with plating. Then, to make the cooking less overwhelming, we spread it out over several days (and there’s no shame in omitting a couple of the sides to make it easier!). Then, it was just a matter of rela together over all that good food, with Sinatra crooning in the background. See individual recipes for more intel on how to make each dish ahead. Order dry-aged beef (from or your favorite butcher), grapefruit essential oil (from , for martinis), and an iSi canister (for Brown Butter Béarnaise Saucesauce to go with beef, from ), if using any of these; you might also want to get an inexpensive butane burner for flaming your Bananas Foster (find at restaurant supply stores and several sources online). Make brioche croutons for Bananas Foster. Toast breadcrumbs for Creamed Spinach. Shop for everything else except beef (if using fresh vs. dry-aged). Make cocktail sauce for Shrimp Cocktail. Cook diced bacon for Wedge Salads and Creamed Spinach. Make rest of toppings for Wedge Salads: Champagne Vinaigrette, Buttermilk Blue Cheese Dressing, and Pickled Red Onions. Make Bacon Béchamel for Creamed Spinach. Mix Martinez Martinis in mason jar and chill. Shop for beef (if using fresh vs. dry-aged). Make Whipped Horseradish Sauce for steaks. Brown the butter for Brown Butter Béarnaise Sauce for steaks. Make Creamed Spinach through Step 2 (without topping). Set dining table, set up bar/cocktail area, and set up a small cart or table for flaming Bananas Foster. Crush ice, poach shrimp, and grill lemons for Shrimp Cocktail. Make Grilled Broccoli through Step 1 (blanch and grill). Unwrap steaks and let air-dry in refrigerator. Make Brown Butter Béarnaise Sauce for steaks. Make Maitake Mushrooms with Thyme and Sherry (through Step 3). Scoop ice cream into bowls and top with lime zest; freeze for Bananas Foster. Prep and chill lettuce, blue cheese, and chives for Wedge Salads. Peel bananas and store at room temp, wrapped in plastic, for Bananas Foster. Follow the steps in sequence now. Think about where you’ll assemble each of your recipes, and set up everything you’ll need for each “station” so the finishing and plating will flow smoothly. Put potatoes for Baked Potatoes in oven, then let sit in a warm spot once done; prep the toppings. Prep seasonings for Grilled Broccoli. Prep toppings for Baked Potatoes. Prep sauce ingredients for Maitake Mushrooms with Thyme and Sherry. Take a bath and relax! Take steaks out of fridge and season with salt. Take Grilled Broccoli out of refrigerator. Put Maitake Mushrooms with Thyme and Sherry on stove in its pan, ready to finish. Put Creamed Spinach on stove, ready to reheat. Heat a grill to high (600° to 650°). Assemble shrimp cocktail; when guests arrive, set in crushed ice to serve. Set Brown Butter Béarnaise Sauce in a hot-water bath to rewarm (unless you’re holding it in an iSi canister); keep in bath till serving. Sear steaks, then pop in oven to roast while you have your first course. Assemble Wedge Salads (enlist a friend to do this while you sear steaks). Reheat Creamed Spinach (without toppings); let sit, covered, during first course. Finish steaks over high heat on grill, then let rest. While steaks rest, crisp up Baked Potatoes on grill. Once steaks have rested, ask a friend to slice them. Reheat Maitake Mushrooms with Thyme and Sherry on stovetop and make sauce in pan. Whisk Whipped Horseradish Sauce to loosen and fluff. Relax and enjoy dinner! You earned it. Slice bananas and make Bananas Foster.